Macroclimate is a new kind of investment company: one that leverages science and technology to help you invest better — with impact. We've been a Dimensional (DFA)-approved fee-only fiduciary adviser since 2004 — and are SEC registered and a Certified B Corporation. As a fee-only fiduciary advisor, we never earn commissions based on where we invest your money – and always put our clients’ interest first. ▼ What is a fee-only fiduciary advisor? Fee-only fiduciary advisors like Macroclimate are regulated by the SEC and adhere to the Fiduciary Standard of Care, which means we always act solely in the client’s best interest when offering personalized financial advice. Fee-only means clients’ fees are our only source of compensation. For example, we do not earn commissions based on where we invest your money. See also: Where is my money held? ▼ What is Macroclimate’s relationship to Dimensional Fund Advisors? Dimensional Fund Advisors (DFA) offers its funds to individual investors through a select group of investment advisors. Macroclimate is not affiliated with DFA, and doesn’t receive commissions or financial incentives of any kind for recommending DFA funds. We do so because: 1) our investment beliefs are well aligned with DFA; and 2) DFA funds offer a way to attain broadly-diversified Fossil Free portfolios at low cost. Mark Kriss, Macroclimate’s Managing Partner, serves as a non-paid member of the Dimensional Sustainability Funds Council. The Sustainability Funds Council is a group of consultants and wealth managers not affiliated with Dimensional working together with Dimensional to research the best ways to provide sustainability investment solutions to investors. ▼ What is Macroclimate’s relationship to Geofinancial Analytics? Geofinancial Analytics, Inc., Macroclimate's sister company, delivers transparency on greenhouse gas super emitters to investment professionals using state-of-the-art satellite remote sensing technology. Macroclimate served as incubator for the venture, and Mark Kriss, Macroclimate’s Managing Partner, serves as its Chairman. ▼ What is a Digital Wealth Manager service? Macroclimate uses state-of-the-art web technology to automate service delivery for your convenience, lower cost, faster response, and improved learning and understanding of core investment concepts and trade-offs for better decision making. Automation means self service — any time, anywhere. This is especially true during the initial portfolio design phase as you explore investment alternatives and trade-offs using our interactive “what if” Risk Profile tool. Other self service features and benefits include streamlined account opening process, 24x7 availability of portfolio performance reports — updated as of yesterday’s close — and free online access to MoneyGuidePro professional-grade financial planning tool. Automation also means enhanced services. For example, graphical performance reports are interactive for improved clarity and understanding. Automation also plays an important role in our internal operations — we utilize state-of-the-art algorithmic rebalancing to facilitate timely cash management, tax minimization and cost-effective trading for your benefit. Do you provide personalized one-on-one investment advice? ▼ Do you provide personalized one-on-one investment advice? Internet clients do not receive personalized one-on-one investment advice from a member of our Advisory Team independent of this interactive website. However, if you have existing holdings in a taxable account, we’d be pleased to conduct an initial analysis of your portfolio – at no additional charge – to make sure that we’re being tax efficient with the rollout of your strategy. Simply “request cost basis analysis” under “Special Instructions” when you confirm your plan selection. See also: What happens to the stocks and funds I already own? CarbonScan, a free tool developed by Macroclimate, estimates the carbon intensity of your existing investment portfolio. Specifically, it reveals the approximate percentage of assets you have invested in the largest owners and producers of fossil fuel reserves worldwide (coal, oil and gas), as well as the largest owners of coal-fired power plants. Estimates are based on the average carbon intensity of the equities asset classes you select. How do I classify mutual funds? MethaneScan, a data service for professional investors developed by Macroclimate's sister company, Geofinancial Analytics, Inc.
▼ Are you compliant with fossil fuel divestment movement standards? ▼ Who can I talk to? Our Client Services Team can be reached at support@macroclimate.com or 415-723-9695 x2, Monday through Friday 9am-3pm Central Time. We pride ourselves on providing flawless, consistent and reliable services. For questions about our investment strategy, our Advisory Team can be reached at info@macroclimate.com or 415-723-9695 x1. Please use our secure Client Portal — not email — for transmission of any confidential information. See also: Do you provide personalized one-on-one investment advice? ▼ How much does a Macroclimate account cost? Please see our Pricing. Other than our fees, the only other costs are the relatively low expenses of the Dimensional (DFA) mutual funds you’ll own and transaction fees charged by your brokerage firm (TD Ameritrade Institutional). ▼ Can you manage my IRA or “orphaned” 401k? Absolutely. We can manage any type of IRA. We can also help you roll an old 401(k) from your prior employer into a Fossil Free IRA. Please note that we will sell any positions in your existing IRA account upon transfer to your new Macroclimate account and reinvest the proceeds per your Macroclimate investment plan. ▼ Which account types do you support? We support individual, joint, and trust accounts along with all types of IRAs. Have an old 401(k)? We can help roll it over into a Fossil Free IRA. We also support endowment accounts for non-profit organizations such as professional associations, foundations, museums, environmental organizations, educational institutions, and religious institutions and organizations. Simply type “nonprofit organization“ under “Special Instructions” when you confirm your plan selection. We do not currently support 401(k) or 529 plans. ▼ What is your minimum to get started? You can open a Macroclimate account with $200,000. ▼ What do I get with a Macroclimate account? In a nutshell, you get an efficient, well-balanced low-carbon portfolio using low-cost, institutional-grade mutual funds from Dimensional Fund Advisors. After getting you into the right mix of investments, our software monitors your portfolio regularly and will automatically rebalance when necessary. You also gain access to MoneyGuidePro, a professional-grade financial planning tool that you can use on your own or in collaboration with your financial planner, and on-demand performance reports through the Macroclimate Client Portal. ▼ How do you design a portfolio for me? ▼ Do you take my taxes into consideration? When you sign up for a taxable Macroclimate account, we’d be pleased to conduct an initial analysis of your existing holdings — at no additional charge — to make sure that we’re being tax efficient with your strategy. Simply “request cost basis analysis” under “Special Instructions” when you confirm your plan selection. Since we don’t trade often once your new portfolio has been established, realizing significant capital gains should be infrequent in most cases. One of our management objectives is tax efficiency — our fund selection criteria values after-tax returns over pre-tax returns. We prefer long-term gains over short-term gains to keep taxes as low as possible. If for tax reasons you’re not prepared for us to sell a security, you can keep it out of your account by notifying us when opening your account. We recommend speaking with a tax professional to discuss your specific situation. ▼ Do you serve international clients? As an SEC-registered investment advisor, we serve clients anywhere in the United States — but not abroad. ▼ Where is my money held? Macroclimate has partnered with one of the most trusted and popular brokerages in the country: TD Ameritrade Institutional. This means if your money is already there, your Macroclimate account will stay there. TD Ameritrade is a member of the Securities Investor Protection Corporation (SIPC). Securities in your account are protected up to $500,000. Details. If your account is at a different brokerage, we’ll open a Macroclimate account for you at TD Ameritrade. We chose TD Ameritrade because they have a great selection of funds, state-of-the-art technology, excellent investor support, and low cost. ▼ How does my existing account become a Macroclimate account? If your account is already at TD Ameritrade Institutional, Macroclimate will be added as an advisor and we’ll manage your account at TD Ameritrade. If your account is at another brokerage, we’ll move your account to TD Ameritrade and manage it from there. Once you get started, our first step is to reinvest your current holdings to create an efficient, well-balanced portfolio for you using low-cost, institutional-grade mutual funds from Dimensional Fund Advisors. After getting you into the right mix of investments, we’ll monitor your portfolio and automatically rebalance quarterly. ▼ How do I pay for my Macroclimate account? ▼ How do I add money to my Macroclimate account? Always include your account number in the memo section of your check. Certified mail with tracking is recommended. For retirement accounts, please also complete IRA Deposit Slip. 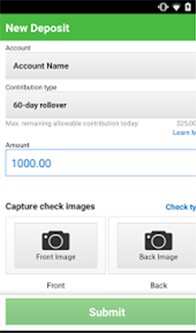 If you prefer, deposit your check using TD Ameritrade’s Advisor Client mobile app (visit Apple®AppStore or Google Play). Refer to screenshot below. If you don’t already have Advisor Client login credentials, please contact Client Services. You can easily add money to accounts via electronic (ACH) transfer from your bank on the TD Ameritrade Advisor Client website as shown below. This is the best approach if you plan to make regular deposits. Please note: account titles/registration must be exactly the same for ACH transfers to work. For example, you can’t ACH transfer funds from a non-trust checking account to a trust account or IRA account. Use check or wire transfer instead. If you don’t already have Advisor Client login credentials, please contact Client Services. Be sure to include your account number and correct account title/registration. ▼ How do I withdraw money? 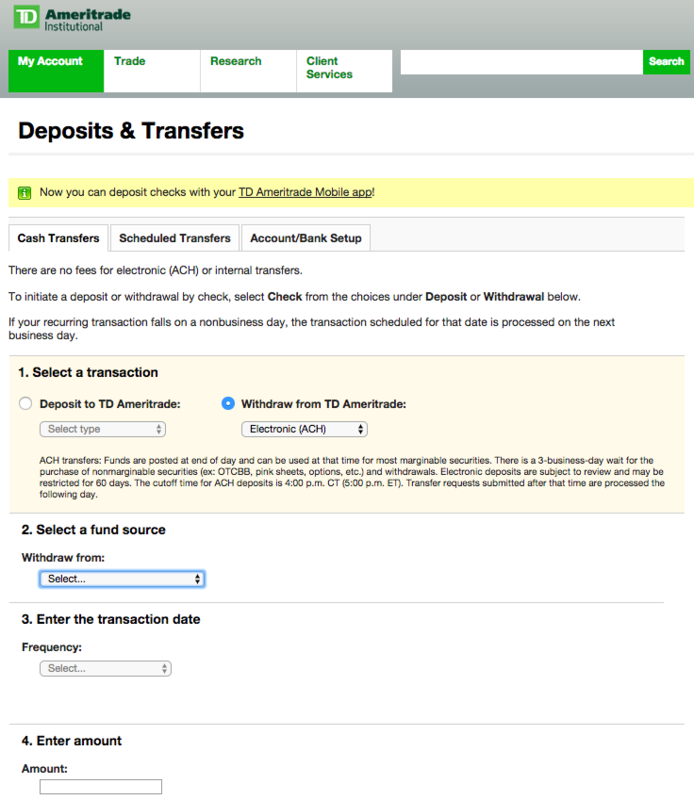 For taxable accounts, you can easily withdraw money at any time by writing a check or via electronic (ACH) transfer to your bank using the TD Ameritrade Advisor Client website as shown below. When you need to withdraw funds, we rebalance to your target allocation following your cash withdrawal. We recommend that you alert our Client Services team 48 hours prior to large cash withdrawals to ensure availability of your funds. To minimize transaction costs, we also recommend that you use a bank checking account — not your money market account on TD Ameritrade — for your day-to-day expenses. ▼ How do I change my risk level or choose a new portfolio? You can change your risk level and/or portfolio at any time by contacting our Client Services team. ▼ Who will send my tax documents? Tax reporting is the responsibility of TD Ameritrade — so all of the documents will come from them. ▼ What about portfolio performance reports? On-demand performance reports are available through the Macroclimate Client Portal. Interactive graphical reports show performance, cash flow and asset allocation as of yesterday’s close, most recent quarter, or any historical period for your account. ▼ How do I close my Macroclimate account? You can cancel at any time for any reason with 30 days notice. There are no penalties for closing your account. We’d simply remove Macroclimate as an advisor on the account and your account will retain your current holdings. (Upon cancellation, you will not be able to purchase additional shares of Dimensional’s institutional-grade mutual funds.) If you choose to then manage your portfolio on your own, your account will be transitioned from TD Ameritrade Institutional to TD Ameritrade’s retail brokerage service. ▼ What is your investment philosophy? Our investment philosophy is to reduce climate and carbon risk while using low cost-funds from one of the most well-respected companies in the industry – Dimensional Fund Advisors (DFA). We believe in creating broadly diversified portfolios – in stocks, bonds and real estate (REITs) – that give you exposure to investments both in the US and internationally. Learn more. ▼ What do you mean by a well-balanced portfolio? Whether you’re comfortable with a lot of risk or lean towards more safety, a properly diversified portfolio will help reduce your risk compared to a non-diversified one. A portfolio that’s filled with a combination of stock and bond mutual funds of various degrees of risk means it’ll be better prepared for any number of situations the market throws at it. In short, a well-balanced portfolio offers you a higher expected return at your preferred level of risk. ▼ What do you invest in? Our primary goal is to build a properly diversified portfolio for you at the lowest cost using asset class mutual funds. To do this, we identified seven key asset classes that have the biggest impact on investment returns and let us diversify your portfolio on two levels: security-level diversification by investing in asset class mutual funds and market diversification by providing exposure to many different markets across asset classes. We invest you in institutional-grade mutual funds from Dimensional. These funds are broadly diversified within each asset class we focus on: US-based stocks, developed (non-US) and emerging market stocks, real estate, government bonds (US and non-US), and real return (inflation-protected) bonds. You can learn more about Dimensional and how we invest here. ▼ Which funds do you use? To view fund costs — and other information — click on name of fund above. ▼ Where can I learn more about your performance? See Performance Record net fees & expenses and last five years. Note: Past performance is no guarantee of future results and current performance may be higher or lower than the performance shown. ▼ Why do you use mutual funds and not stocks? Our goal is to implement a broad asset allocation at a low cost. The funds we’ve chosen can accomplish this goal, particularly for smaller asset levels. Investing in individual stocks would involve many more transactions and incur significantly higher costs for you. ▼ Where can I see how I’ll be invested? ▼ What happens to the stocks and funds I already own? Our goal is simple — to provide you with a low-cost, well-balanced and environmentally responsible portfolio operating at the risk level you choose. Typically, everyday investors are often paying too much in fees and/or own a portfolio that’s not well-diversified (translation: taking on far too much or too little risk). To provide you with an efficient portfolio geared towards long-term growth, we will sell your current holdings and replace them with low-cost, well-diversified institutional-grade funds. If you have existing holdings in a taxable account, we’d be pleased to conduct an initial analysis of your portfolio — at no additional charge — to make sure that we’re being tax efficient with the rollout of your strategy. If your transferred assets hold substantial unrealized gains, the report will include at least two rollout options for you to choose from. Simply “request cost basis analysis” under “Special Instructions” when you confirm your plan selection. (Please allow three weeks following receipt of your assets at TD Ameritrade Institutional.) An illustrative example is shown below. Note: Capital gains taxes are only triggered when an asset (like stocks or mutual fund shares) are “realized” (sold) for a price that is higher than the purchase price — not while it is held by an investor. Our free cost basis analysis described above may be advisable if you think you have holdings with substantial unrealized gains in a taxable account. Since capital gains in tax-deferred accounts like IRAs or 401Ks accumulate tax free until the investor takes constructive receipt of the gains (i.e. withdraws cash from the account), they are not subject to these capital gains tax considerations when restructuring investment portfolios. Please consult your tax advisor regarding your personal tax situation. ▼ How often do you rebalance? We rebalance quarterly – and, as needed, when you add or withdraw cash from your account. As you add cash to a portfolio, we buy more mutual funds to maintain your target allocation. To keep transaction costs low, we won’t buy a small amount of a security if it results in unnecessary transaction fees. When you need to withdraw funds, we rebalance to your target allocation following your cash withdrawal. ▼ How do I close my Macroclimate account? Are there any penalties? Investment risk is the risk that your investments could go down in value. We measure risk by looking at how stable investment returns have been in the past. For example, an investment of $100 whose value fluctuated between $90 and $110 over the course of the year is riskier than an investment whose value fluctuated between $95 and $105. More importantly, we also look at how different assets move at the same time — that’s how diversification lowers the riskiness of your portfolio. ▼ How do you forecast how the portfolio may perform over time? We use historical information. We end up with a range of outcomes and the wealth charts in our Risk Profile tool illustrate this data. Please note that past performance does not guarantee future results and that we use past performance only as an indication of potential future results. ▼ How are the answers to my questions mapped to an asset allocation? We look at both your appetite for risk and your ability to take risk. You may want to take a lot of risk (appetite) but given your age, spending needs, and income (ability), we may adjust our recommended risk level for you. You are always in control of your asset allocation. Our recommendation is based on your answers but you can override our recommendation and chose a different allocation. ▼ What happens to dividends? ▼ What is bank-level data security? “Bank–level” data security means we adhere to the same 128-bit encryption security standards as your bank. More on our information security practices. ▼ Can you move my money in and out of my Macroclimate account? Only you can direct the movement of cash into or out of your account. The sole exception is the fees you pay us at the end of each quarter, which are automatically deducted from your brokerage account per your authorization. See also: How do I withdraw money? ▼ Is my money safe? All Macroclimate accounts come with Securities Investor Protection Corporation (SIPC) coverage, which protects securities and cash of the customers of its members up to a maximum of $500,000, of which $250,000 may be cash. For additional information about SIPC coverage, including a brochure, please call (202) 371-8300 or visit www.sipc.org. ▼ Do you sell my personal information?